No matter what your definition of play may be, Ludlow, Vermont offers year round options of fun for all ages and interests! Winter in Ludlow is spectacular. 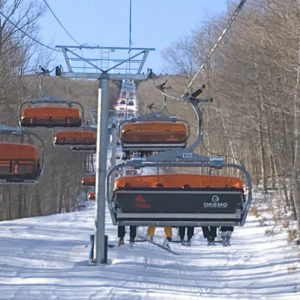 Okemo mountain offers 121 ski runs and one of the country’s top rated lifts, the heated orange bubble chair. Okemo is located about a mile away, just off Pond St. Why drive when you can catch the free ski shuttle just steps from the front door of the North House Lodge. You’ll find ski shuttle times and information in each of the kitchens. Springtime in Vermont is overlooked. It’s hard to compete with spectacular fall foliage and white winters and mounds of snow everywhere. Yes, early spring during snow melt time is mud season but late spring is a sight to behold! New vivid shades of green growth are bursting out of tree limbs and bushes while early season flowers add colorful accents. Oh, and the heavenly scent of lilac blooming fills the air everywhere! Look for one in our driveway on the #54 side! Open Studio– drive the VT countryside and visit artists who host a lovely open house in their studios all weekend long. Usually held the end of May and fall. Summer is wonderful in Vermont, and Ludlow is gaining in popularity for its location and all the area has to offer. There is no shortage of outdoor activities available during the summer season. Swim, kayak or relax at a nearby lake, hike Okemo Mountain, or drive most of the way and hike the rest to the fire tower. Corn maze – 1881 barn is the best! Summer outdoor free concerts. Grab a lawn chair (we have several for our guests! ), your favorite libation and a snack and plan an evening of relaxation at an outdoor concert. Local ones are held at Jacksons Gore on Okemo, Ludlow and several other local towns offer free concert series all summer long on Friday or Saturday too. Corn maze –Hathaway Farm, a 12 acre corn maze voted one of best in the country. Open through the end of October and on select Saturday nights. Ludlow is spectacular during fall foliage. The mountains that surround the town are full of autumn colors in golds, reds and oranges. Corn Maze, Hathaway Farm 12 acres corn maze voted one of best in the country. Open through the end of October and on select Saturday nights. Check the website or call for more information. Antiquing – We love the town of Chester for good deals and great antique stores! There are so many things to see and do locally and with a short scenic drive. Here are a few of our favorite local attractions in and near Ludlow. Drive up Okemo Mountain – Open during non-snow season. Take a gorgeous drive up the paved road that is a ski trail in winter. There are several parking spots near the top to watch the scenery below. Fabulous spot to take in the views of Okemo Valley at the end of the day with a wine and cheese plate. Drive all the way to the upper parking lot and walk the rest of the way up (light hike on gravel roads) to top of ski lifts for more spectacular views. See the entire town and several other mountains nearby and below. Jackson Gore – Hosts a wide variety of activities year round. Zip lining, challenge course, rock wall climbing and more available during non-snow seasons. You’ll find a luxurious full service spa and fitness facility in the Ice House. There is also a public ice skating rink in winter. Check out the seasonal free weekend concerts in the summer and year round hosted events. Take a short hike to see our three local waterfalls with swimming holes. The beautiful surroundings are wonderful year round. Take the 103 towards Rutland, pass the light at Rte 100, take first right at Buttermilk Falls Rd, drive until the end or park on side of road. There are several trails on the road. More favorite things just out of town. Be sure to check our seasonal list of activities and attractions too! Hildene – Manchester (30 minutes) Abraham Lincolns son’s estate, now museum with a Pullman car Exhibit. They offer museum membership reciprocity. Hosts year round events. Calvin Coolidge Museum and Homestead – Take a scenic drive to Plymouth (20 minutes) Fabulous, authentically maintained town and gravesite of 30th president Calvin Coolidge. Check out the Plymouth Cheese Factory there too. Vermont Country Store – Weston (11 miles) worth seeing at least once, especially if you enjoy vintage toys, and old-time penny candy. Drive to Woodstock VT– Spectacular drive year round. There is a basket of pamphlets near the TV in each the #54 and the #52 homes with more visitor information. You’ll find tourist maps at no charge, just about everywhere in town.